Many of you know that I have a one-man-band called Merankorii, but only a few know that I also have another musical project, called Ambiansu. After interviewing M., the person behind the one-man-band "Ambience", whose latest album "As Dez Esperas" I considered one of the 10 best albums of 2007, we kept contact, and one thing leading to another made us want to try something different. The result, Ambiansu is more or less what you could expect from a fusion of Merankorii and Ambience styles (and something that people are generally describing as better than any of those two projects alone, but I'll leave that for you to decide). 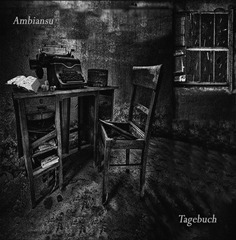 Almost two years later, we had a musical project with one album released: "Tagebuch". Tagebuch is an opus of 5 pieces, a mix of what's classical with what's disruptive, and what's traditional with what's unconventional. Instead of entering into much details, I'll instead ask you to listen. It was released in a 500 copies limited edition CD in card box, and it costs only 8€ (postage included). And the best part of it? If you buy it until the end of the year, for each CD you buy, I'll offer one to a library. Before you ask: no, we don't intend to have the album for sale in digital form. On the other hand, it costs less than your typical mp3 album, I'll offer one to a library with each purchase, and you can always rip it to your favorite format and give the CD to a friend (yes, this is a promise that we won't charge you for "piracy" or any other of those silly things).